Every cook should know how to care for your knives. If you have invested in a quality set of kitchen knives, or something like a $50 chef’s knife, you naturally want them to last a lifetime. And they can, if maintained properly. But how? Good news is, while high end knives do have some specific requirements to keep their good shape, caring for them is much easier than it may sounds. In fact, it’s not time consuming at all! Some simple little change in the kitchen habit can go a long way in protecting them. 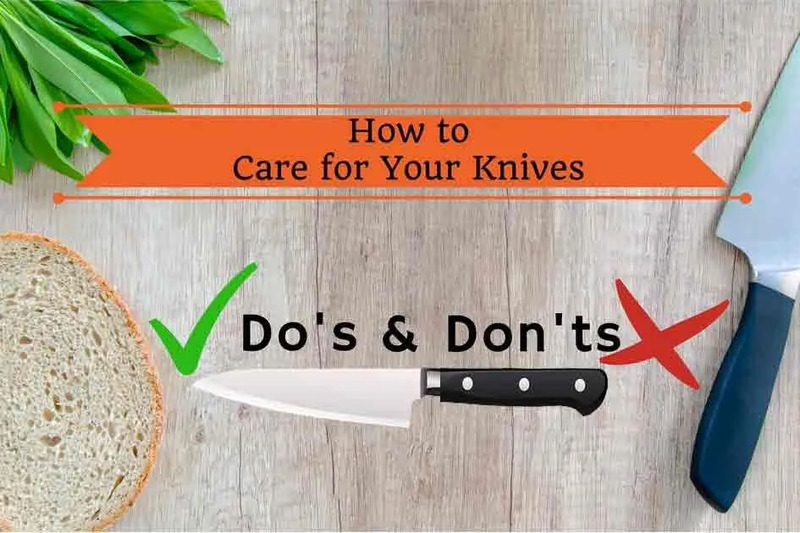 Let me show you the right steps in caring for your knives, and then common mistakes to avoid if you want to pass your awesome collection of cutlery to the grandkids. Everything is subject to change, and even the expensive knives that start out surgically sharp will eventually get dull. To keep that sharp edge, hone the knife before every use or after several uses. Honing is super easy and fast to do with a steel rod. There are electronic kits on the market to make it even easier. Sharpening is a bit more complicated, but not impossible if you’ve got a bit of patience. Or if you’re lazy like me, you can get it done by a professional. Good news is, if you hone your knife often, you won’t even have to sharpen them more than once a year. I actually wrote a guide with step by step instructions on how to hone and sharpen your knives. It’s not all that difficult, and there are various types of sharpeners to help you do the job. Take a look at our review article to find the one that best suits you! Most quality knives are made of stainless steel or high-carbon steel, which makes them less prone to rust compared to other materials. However, if left dirty for too long after use, the acid, water, and other chemicals from the food will eventually destroy the blade, leaving dark spots and rust on it. Washing the knives as soon as you finish using them is the best way to prevent this. Even when a knife is dishwasher safe, it’s still better washed by hand. The reason is simple: your hands are so much more gentle than a dishwasher. If you go through all of your knives one by one with some mild soap and a cloth, the chance that a blade will be chipped during the process is extremely thin. Besides, hand-washing the knives also allows you to see if there is any dirt or food particle getting stuck between the blade and the handle, so you can take care of it immediately. It is usually okay to leave your knives to dry themselves on a dish rack. However, to minimize the chance of the blade getting rusted, wipe them dry with a cloth right after you wash them. That also allows you to put them into a safe place right afterwards, instead of having to wait for them to dry. A clean and sturdy wood or bamboo block is the best home for your knives. First, it protects the blades from dirt. It also minimizes clashing among the knives or between them with other objects in the kitchen. If you have a big set of knives and don’t like having to pull all of them out before you can get the exact one, keeping them on a magnetic strip may be a good idea. A magnetic strip is very convenient, as it shows the blades and you can immediately tell which one is the one you need. It may not offer that much protection from dirt, but it does keep the knives in place and prevent them from clashing against each other. A sharp blade must have a thin edge. And thus, however strong the material is, the edge is still very prone to damages if it gets in contact with things it’s not designed to cut, like a ceramic plate or a metal countertop. A wooden cutting board is the best companion for your blades. A plastic one is good too, except it may be a little more difficult to sanitize in the long run. Leaving them dirty is the fastest guaranteed way to invite rust onto your knives. The chemicals from the food, juices and sauces can cause corrosion, seen as brown spots on the blade. This causes the knives to become rusty and dull very quickly. Unless it is stated that your knife is dishwasher safe, never wash it with the machine! All the rubbing and clashing will make the blade chip beyond repair. In fact, even when a knife is dishwasher safe, hand washing it can significantly prevent chipping and prolong its life span. A good knife can help save your time in many ways – reciprocate the dedication by spending a minute to hand wash it! Don’t put them there: they can rub against other items and get chipped. Even when there’s nothing else in there, the movements caused by your pulling and pushing the drawer can still be harmful to your knife. If you really want to leave them there, use a cover to protect the blade. This is not how to treat any knife, let alone an expensive one. Clashing on a hard surface like granite or metal can ruin your knife and dull it extremely quickly. Give the knife a chance of survival and put a cutting board in between it and the stone. Yes, the cutting board is for protecting your knife, not the granite.